CreativeMornings is a monthly breakfast series for the creative community. Each event is free, and includes a 20 minute talk. 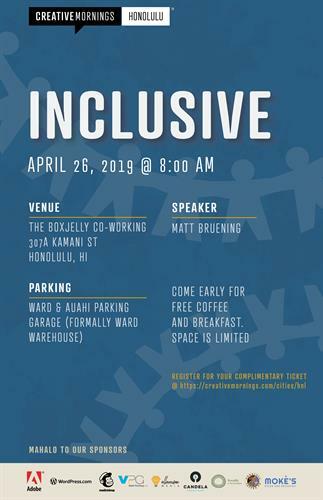 Join us for fresh coffee, friendly people, and breakfast provided by Moke's Bread and Breakfast and coffee from Honolulu Coffee Company while we celebrate our city’s creative talent, but also promote an open space to connect with like-minded individuals. From design legends to hometown heroes, speakers are selected by each chapter based on a global theme each month. This month our speaker is Matt Bruening, fashion designer and social media extraordinaire. The topic for this month is "Inclusive." April 26, 8:00am - 9:30am HST. Come early for free coffee and breakfast. Event is free, but space is limited. Registration required.